Thandi is a young smart teenager with a family looking out for her bright future. Her older sister Margot works overtime at a hotel resort, stashing away her earnings (regular salary and cash from extracurricular activities with male guests). Thandi's mom peddles overpriced souvenirs to cruise ship passengers and tourists to Montego Bay. Despite her family bending over backward to put Thandi through school, she just wants to be an independent woman and pursue her interest in art. The island of River Bank is full of diverse residents: ambitious, lazy, loyal, betrayers, straight, gay, determined and unfocused. Here Comes the Sun is the story of their self-discovery. Most of my bookhearts rated Here Comes the Sun four and five stars. So of course, I knew this was a good read. And it started off as such. The characters were passionate about their beliefs and firm in their actions. I liked the strong females until...I didn't anymore. The same beliefs and actions that the characters were so steadfast in, made my eyes roll. Where is the growth? The maturity? The progression? Then I realized it made the book all the more realistic because some people in life really don't mature for the better. As readers, we don't always get the ending we wish for. 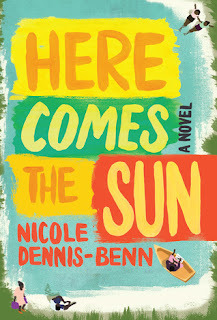 I still recommend Here Comes the Sun but there is no rush in reading it.